Can you build a website? Then you can build a desktop app. If you know how to build a webpage then you have all the skills you need to build a desktop application for OSX, Windows, or Linux using Electron. This guide helps bridge the gap between your skills and getting an Electron project up and running, and out into the world. The biggest snag in my project came at the beginning and the end. The majority of development time was spent figuring out how to get things set up initially, and publishing a cross platform application. Get a preview of the content. 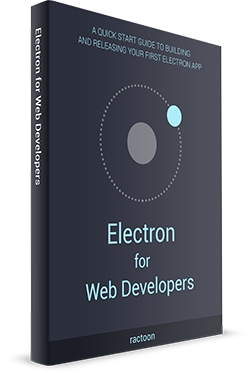 Enter your email address and you'll get the first sections of the “Learn Electron for Web Developers” guide. 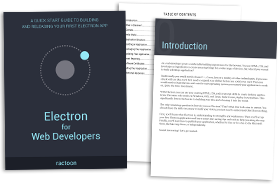 As a quick start guide you’re taken through the essential details of Electron to get started. Beginning with how Electron is structured, you see how the environment is built to use web languages to build desktop applications. From there you learn about the caveats of using Electron for your project to get a better sense of when it is the right tool for the job. Next you’ll dive into your first application, learning how building an Electron application compares to building a website. Finally, you’ll learn the necessary steps to deploy your application, including: creating an installer, setting up and rolling out updates, how to handle crashes, certifying your application for both Windows and OSX, and how/where to sell your application. After going through the guide you will be equipped with the necessary knowledge to start building your own application. Though the guide covers quite a bit, you may find your own application requires digging deeper into specific areas. For that reason there are additional resources provided for those looking to take their application to the next level. The guide is based on my experience building WP Express, which was initially released as a freemium product with the ability to pay to unlock additional features. My experience with building the application, and preparing it for sale, seemed like areas other guides and tutorials didn't quite cover. So this guide is the content I would have liked to have during my project. How deeply is Electron covered? The guide covers the development flow of getting a project set up, installers/executables generated, and certificates purchased/applied with additional details on application updates, crash reporting, and sales. I’ve tried to avoid just replicating documentation or materials that can be found elsewhere. We do build an application together in the guide as well, to see how the pieces fit together with your web development skills. Every project will be unique, and the goal of this guide was to cover those topics that apply to all Electron applications. However, references are provided throughout the guide, and within the “Additional Resources” section, on where to look for deeper information if your project requires it. Sure! Reach out to me at kyle@learnelectron.com and I’ll get back to you as soon as possible!